Get all the latest news, event updates, and exhibit updates delivered to your email! 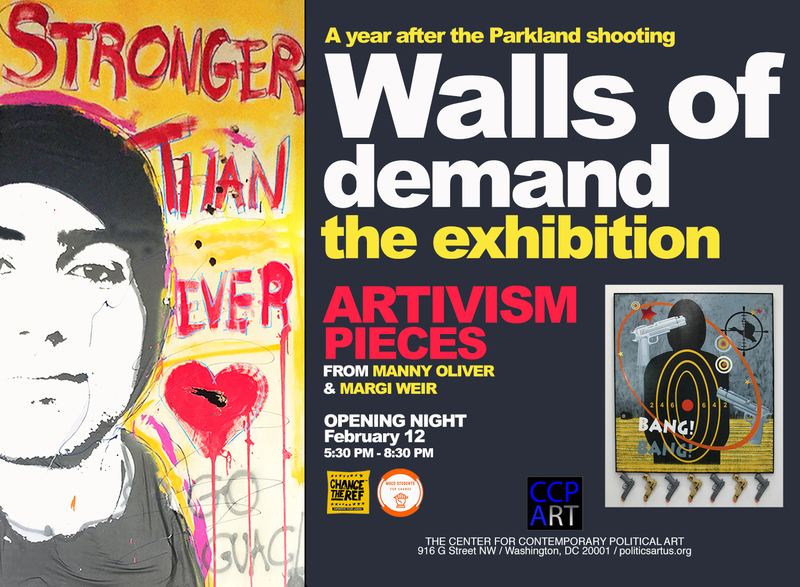 Artists Manuel and Patricia Oliver, the parents of murdered Parkland student, Joaquin Oliver; activists, elected officials, and student activists honored the victims of gun violence. Manny discussed his art and how it has, and will continue to inspire action. Join Poets Sarah Browning (Co-Founder, Split the Rock), Katherine E. Young (inaugural Poet Laureate of Arlington) and Tara Campbell (DC Commission on the Arts & Humanities award-winner) for a reading and open mic. Writers and poets will interact with Jonathan Talbot's "Spin & Win," spinning the wheel and reading a poem or micro-fiction that responds to the call to "resist," "cry," "witness," "rage," etc. Drink Trump’s Kool-Aid and celebrate delusional thinking! Leaving from the Center for Contemporary Political Art (CCPART) at 2:00 pm, the artist and a band of Donald Trump look-alikes wearing Trump masks will take Joey Skaggs’ mobile Trump Kool-Aid Stand to the streets, bringing Trump’s Kool-Aid to the people. Everyone is invited to participate! Print your own Trump mask here or pick one up from Joey Skaggs at the event. Trump’s Golden Throne and Trump’s Military Parade. Later that day, on Sunday, October 28, 2018, from 5:00 pm to 7:00 pm, come watch ART OF THE PRANK, the 85-minute award-winning feature documentary by Andrea Marini, chronicling the unique journey of Joey Skaggs, a pioneering American artist and activist who created his own form of guerrilla marketing using the media as his medium. Since the 1960s he has made searing and often hilarious social commentary. Joey Skaggs will do a Q&A after the film. Peter D. Hart is regarded as one of the top analysts of public opinion in the United States. He is a leading shaper of national trends and political messages. Peter is the chairman of Peter D. Hart Research Associates since 1971, and is a senior counselor to TMG Strategies. Together with Robert Teeter or Bill McInturff, Hart and his company have provided NBC News and The Wall Street Journal with polls since 1989. When not working as an artist, David is the Lombardo Family professor of philosophy at Brown University and author of Democratic Authority (Princeton University Press).